Lagoon Liners that offer the longest life and durability. Lagoon liners have become a requirement for many farms & dairies. 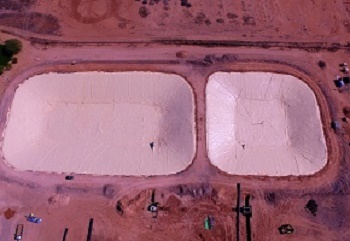 The proper liner allows for the containment of manure and run off of agricultural waste without contaminating the land. In some cases with proper containment & systems in place, lagoon liners can also allow for reuse of manure for renewal energy. In which state and county is the lagoon located? What is the age of the dairy or farm? How large is the lagoon? In many instances we have worked with the NRCS & EPDA to understand the requirements in a particular area to ensure all regulations are met with the lagoon liner we provide. We also assist environmental engineers to help them understand what type of liner will work and to help assist with any penetrations such as pipes that may be involved with the lagoon. We provide installation of our liners as well and have several service locations across the country. We can also review blueprints to ensure the lagoon liner is designed to fit with minimal waste and provide a more affordable installation by our crew or another. We will help ensure that the correct liner is being used to help provide the best value in each particular situation. Our Reinforced Polypropylene is the most common recommendation for a lagoon liner. It has excellent leak resistance with a highly formulated thick coating which provides excellent abrasion resistance and weld strength.The scrim (thread) in our Reinforced Polypropylene provides excellent tear & puncture resistance as well. Although this is the liner of choice in many cases, Western Environmental Liner provides dozens of options such as LLDPE & PVC to ensure whatever regulations are required they can be met at the most affordable cost. Our parent company, Western AG Enterprises specializes in agriculture, providing many services throughout the nation for the agriculture industry so we understand the unique needs of dairies and farms. Please contact Western Environmental Liner and allow us to provide you with the best lagoon liner value available.